Last week CPDN scientists travelled to Nairobi and, together with Kenyan scientists, gave humanitarian organizations, policy makers and journalists in East Africa critical and timely information on how the Kenyan and Somalian drought of 2016 were influenced by anthropogenic climate change and El Nino. 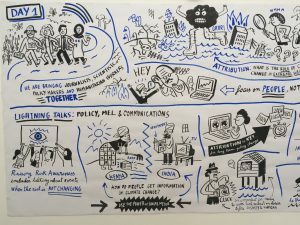 The work was part of Raising Risk Awareness – a unique collaboration between scientists and communicators to assess the contribution of anthropogenic climate change to extreme weather events in developing countries in East Africa and South East Asia, and identify how such information could help to bridge the science-communications policy gap. Using results of the weather@home model runs over Africa, CPDN scientists worked quickly to identify how the probability of these events changed. They were joined in their efforts by World Weather Attribution team. Findings suggested that in a region with very large year-to-year variability uncertainties in attributing changes in extremes are large. While the team can exclude that climate change made the drought in Somalia more than five times more likely they found that an increase in the temperatures exacerbate the impacts of the drought in Kenya. At a workshop and press conference in Nairobi, scientists then worked with Climate Central and the Red Cross Climate Centre to translate these findings into science summaries for journalists and policy makers. At a final press conference and live TV broadcast, the findings of the Kenyan assessment were shared with the public. The workshop also provided an opportunity to summarize many of the other outcomes of the Raising Risk Awareness project. Work included scientific research not only in East Africa but also in India, where the team examined recent heatwaves and floods. In addition, the project involved much needed research to identify best ways to communicate climate risk and new ways to measure the impact of attribution assessments and capacity building visits between partners. Future key priorities for work will include include improving public access and capacity to the data and methods in developing countries, improving country-specific communication materials and exploring other extreme events in the region.